Zionism is the embodiment of Jewry’s continuity with its national, religious and cultural past. Post-Zionism – anti-Zionism – is the continuation of Jews’ objections that emerged alongside Zionism to the rejuvenation of their historic civilization. This book examines the dimensions and implications of the anti-Zionists’ struggle against Israel as a Jewish nation. In a strong and documented rebuttal of post-Zionist claims, Zionism’s vitality is shown to be pivotal in contemporary debates about Jewry’s national and cultural existence, and the future direction of the Israeli state. 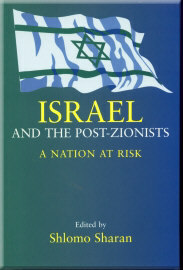 The twelve contributors, well-known Israeli and American scholars, address all aspects of the post-Zionist debate, including: the state’s jurisdiction in religious matters; international public opinion and international law in conflict with Israel’s national interest; and the relationship between opponents of Jewish national renewal and Arab resistance. Some of these questions are as old as Jewish statehood; others have emerged only recently. They emanate from events and processes that the Jewish state and Israeli society have undergone in the last generation. They result from the confrontation between Zionism and “post-Zionism”, and from increasing contact with the so-called “global village”. The contributors include: Edward Alexander, Hanan Alexander, David Bukay, Norman Doidge, Raya Epstein, John Fonte, Yoav Gelber, Yosef Oren, Arieh Stav and Hillel Weiss.